Legio Minimus: 40k Skirmish 2011 Round 2 Space Wolves vs Lysander Marines in a modified "Secure and Control"
40k Skirmish 2011 Round 2 Space Wolves vs Lysander Marines in a modified "Secure and Control"
Lysander lays a beating on everything even Thunder Wolf mounted Wolf Lords! The mission had 5 objectives, one centred in each table quarter and the other in the centre of the board. Each was worth the same amount so it was fairly straight forward game. My plan was to hold the centre, my own and far right while denying him the other objectives. 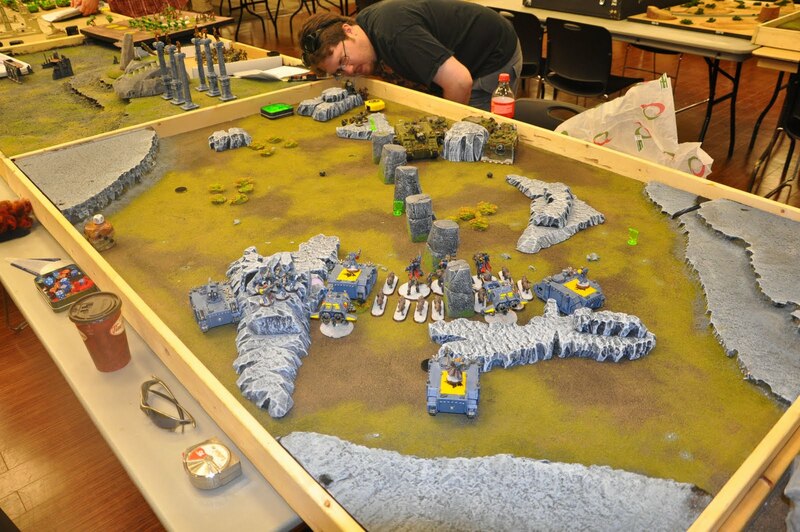 We were playing the table quarter deployment so I started with everything on the board. 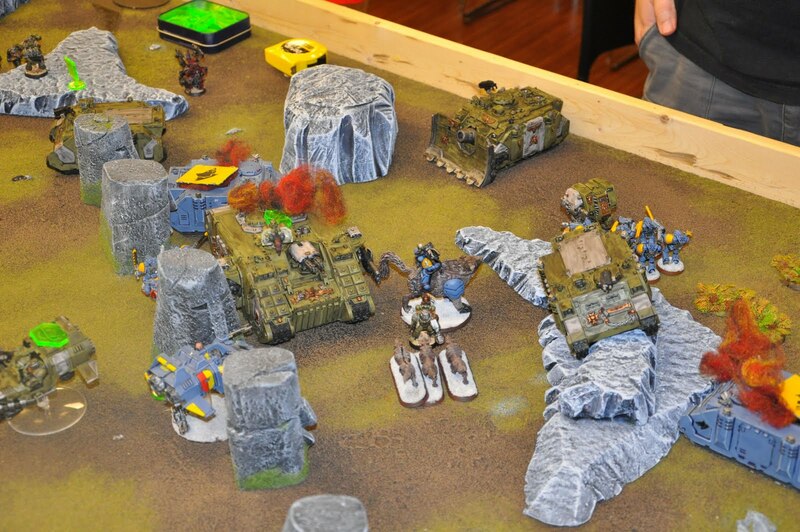 The lines are drawn and the wolves are marching right at the Marines. 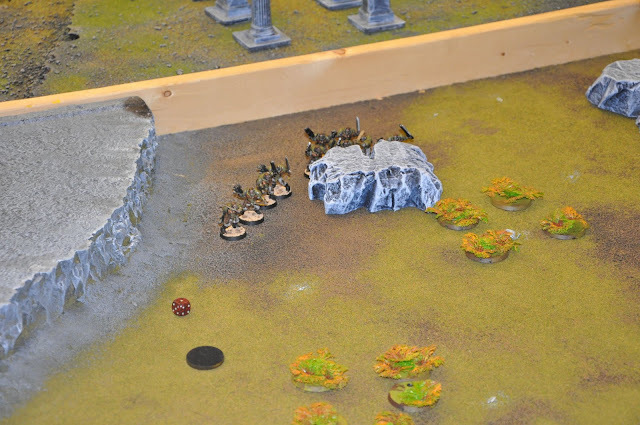 Lysander attempts to bring his forces in waves and take care to use any and all cover, will it work? Tech Marine sets up on the hill to support the Marines advance. Long Fangs do the same across the board. The Wolves move forward and receive a charge from Lysander and his escorting Terminators. 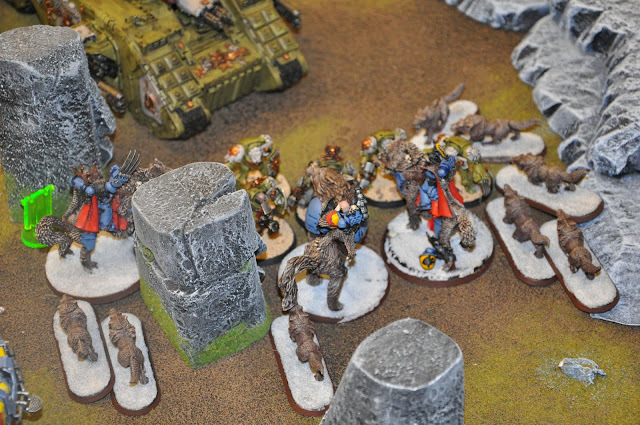 The Wolves manage to stun the Vindicator and destroy the Thunder Fire Cannon! The Wolves counter attack the terminators with the Fenrisian wolves dragging down the majority of the Terminators. 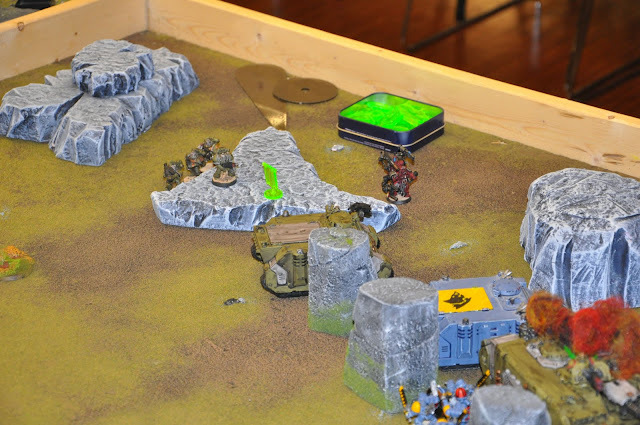 After the first round all the Terminators are gone but Lysander remains un-phased by the loss of his squad. 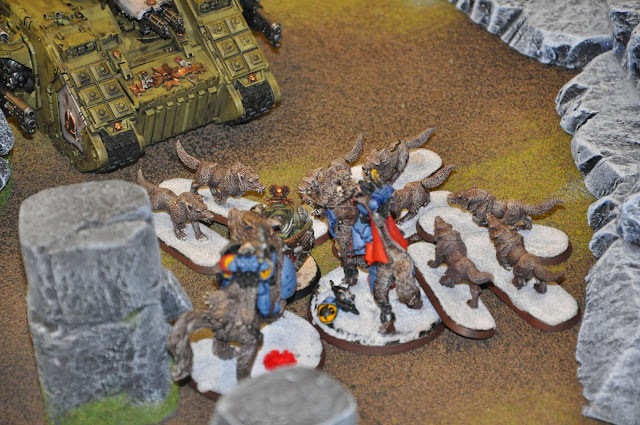 Lysander demonstrates just how much hurt can dish out instantly killing Canis Wolfborne! 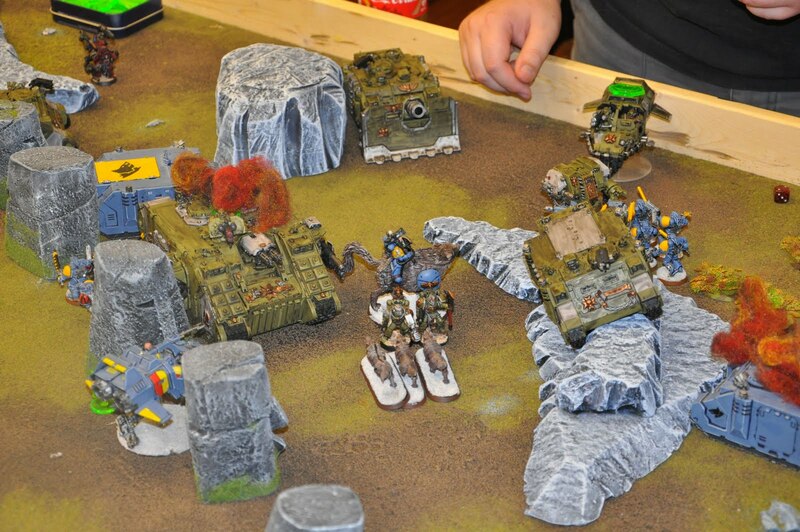 The scouts arrive from reserve and prepare to make a play for the only objective without a unit near. 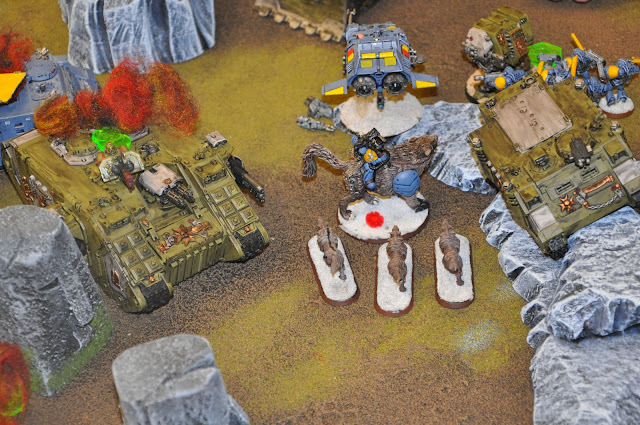 The Land Speeder and Dreadnought move to engage the Grey Hunters holding an objective, while the Land Raider is stunned by Long Fang fire. 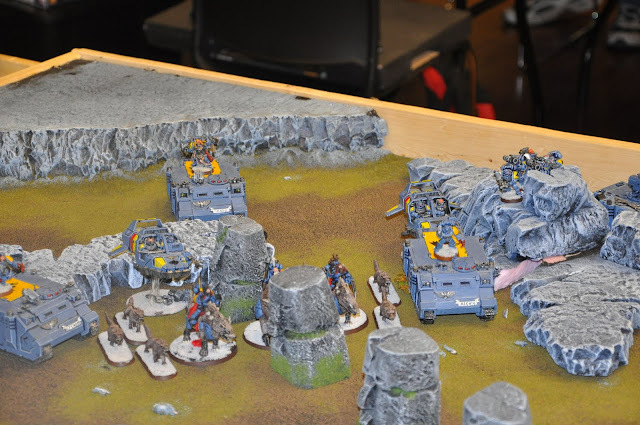 The Company Command Squad moved up to support Lysander but it was too little too late. 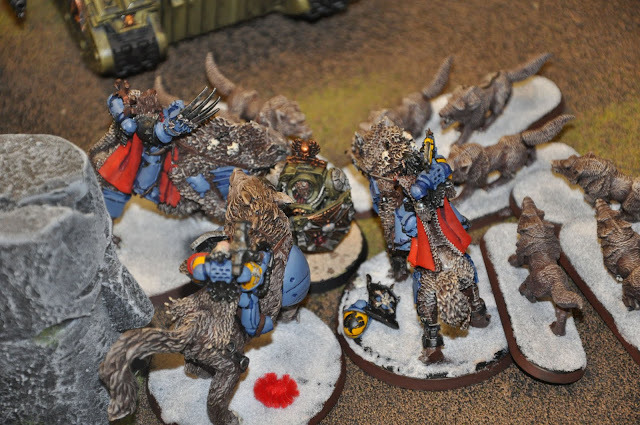 However, Lysander kills the other Wolf Lord in the process. 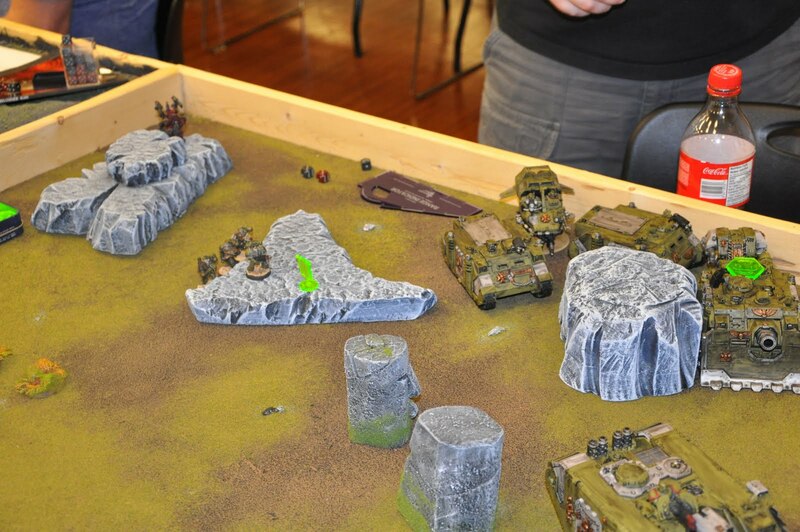 The Land Speeder takes out the Land Raider while the Rune Priest stuns the enemy Land Speeder. 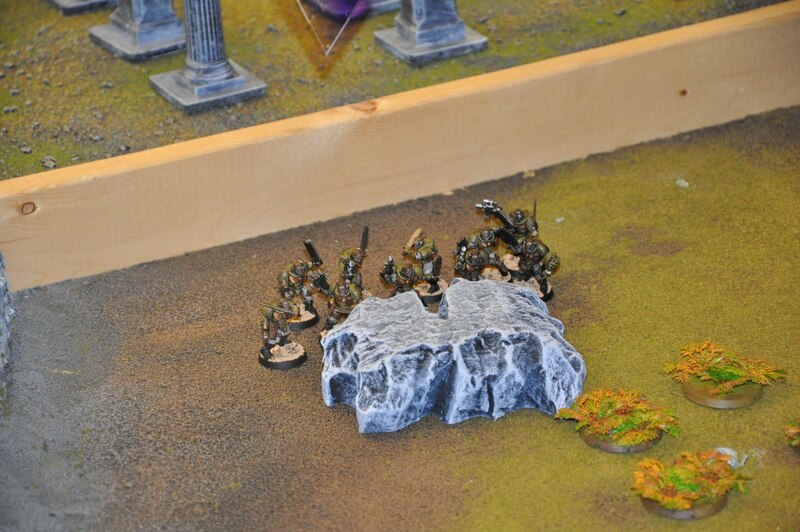 Scouts start to congo line to the objective trying to stay mostly in cover. The Rhino mess with lines of sight and cover for their respective squads, while the Tech Marine moves to get into the fight. 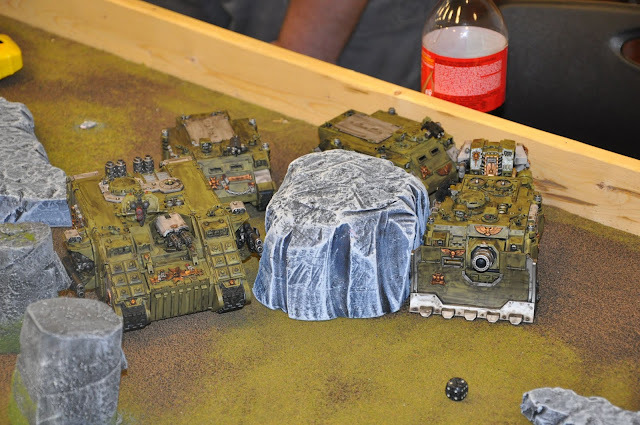 The Company Command Squad will just not die and they hold one while the Speeders trade shots and the Dreadnought loses its CCW to the Grey Hunters. Grey Hunters continue to hound the Dreadnought this time immobilizing it. 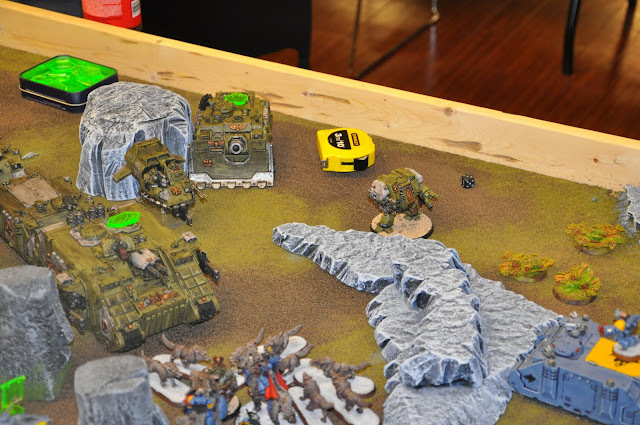 The Land Speeder moves in for the kill against the Vindicator. 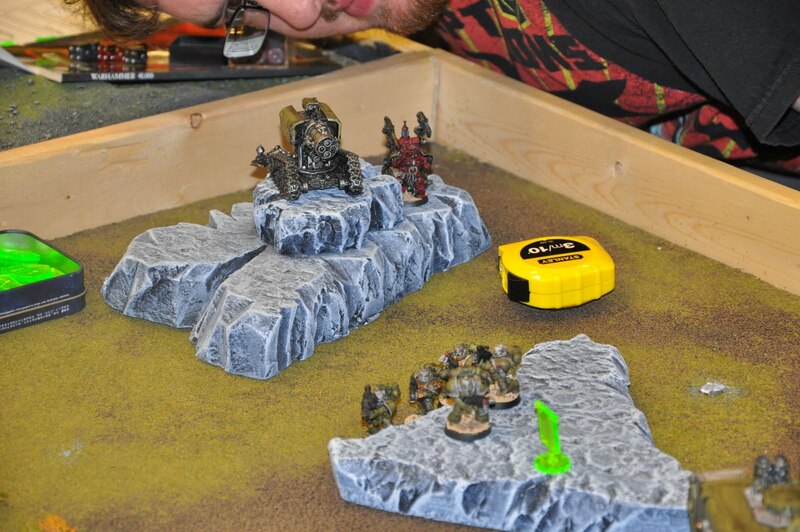 The Wolf Lord finally kills the squad and prepares for the next challenge. 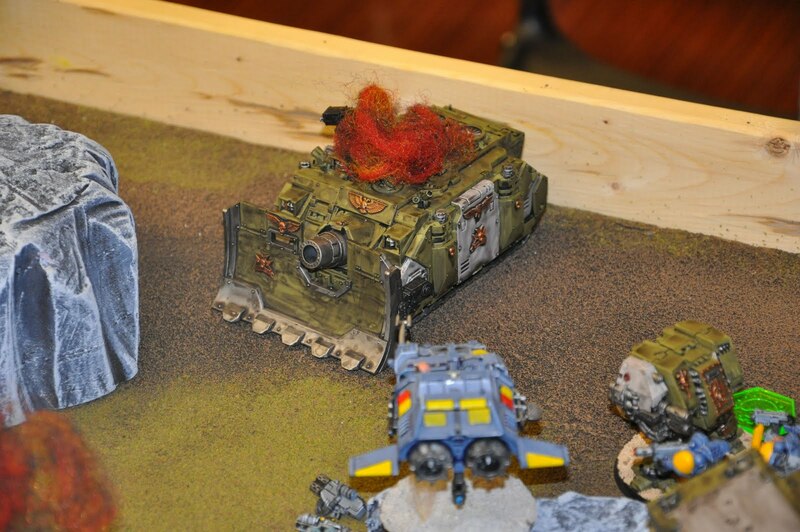 The Land Speeder finds his mark and knocks out the Vindicator. 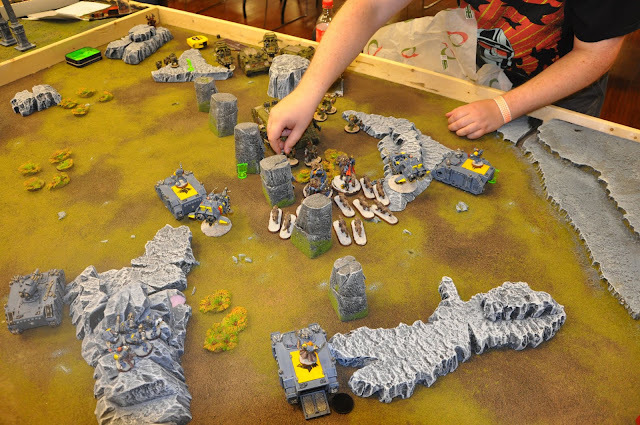 We played another couple of turns with me taking out his Rhinos, Squad in one and the Scouts while securing 3 objectives and contesting the other two. It was a great game and I have to say that Lysander is a force to be reckoned with having felled two Wolf Lords in CC! At this point I'm 1-0-1 for the day and having a great time. Stay tuned for Battle Report 3 from 40k at Skirmish 2011. 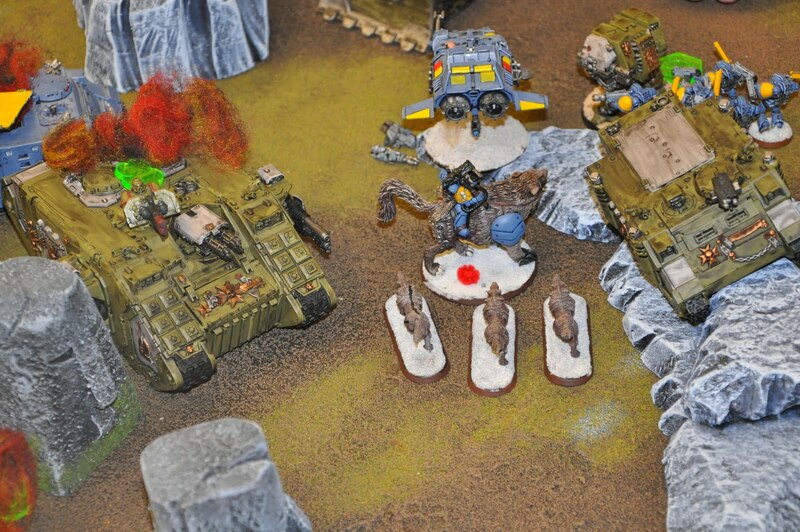 I think it is a mistake to put Lysander straight in with Terminators. He is best used with Sternguard. 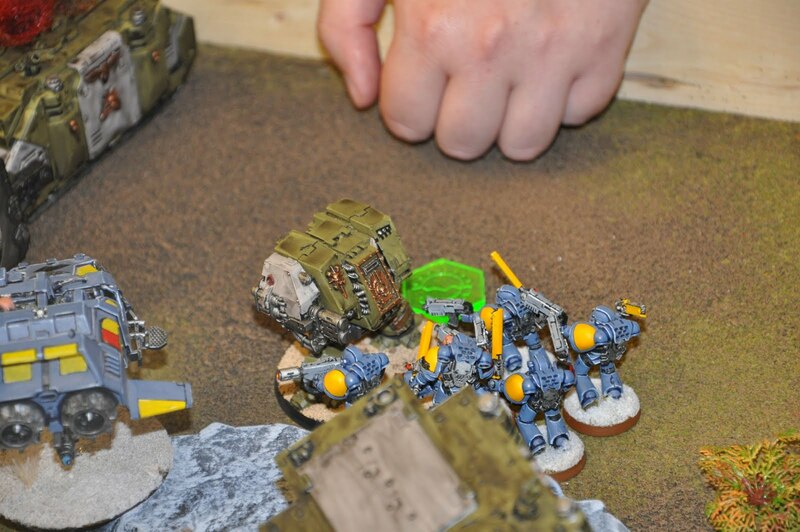 He can break off from them if necessary to help the Terminators but I think him with bolter drill and Sternguard is just ridiculous.